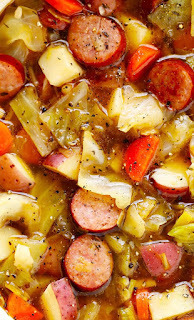 On a cool, rainy day in New Braunfels, TX, Barry made a pot of German-inspired soup. Fitting for a town founded by Germans in 1845. Heat the olive oil in a large soup or stock pot; add onions and carrots and sauté for about 5 minutes, stirring occasionally. Reduce heat to medium-low, cover, and simmer for 15-20 minutes, or until the potatoes are cooked and tender. Taste and season to taste with a few generous pinches of salt and additional black pepper—depending on how seasoned your sausage is; could also add additional Italian seasoning.